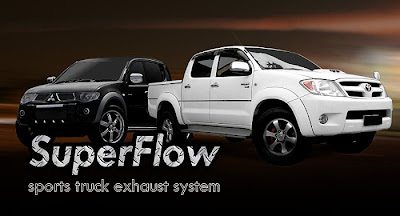 SuperFlow bolt-on exhaust systems are specially designed for today's modern diesel trucks. STAGE I UPGRADE: Down pipe bolt-on kit. STAGE II UPGRADE: Cat Back bolt-on exhaust kit. Newly improved second generation SuperCircuit Hilux Cat back Bolt-on Kit, now is more responsive and better performance! Newly improved second generation SuperCircuit Triton Cat back Bolt-on Kit, now more responsive and better performance! All SuperFlow products designed and produced by us are with original factory parts and labour 12 months warranty*!